Continuing with their trend this season of presenting plays with music, the Jungle Theater opens Lady Day at Emerson's Bar and Grill on this holiday weekend. This play with music premiered off Broadway in the '80s and on Broadway in 2014, winning Audra McDonald her sixth Tony. 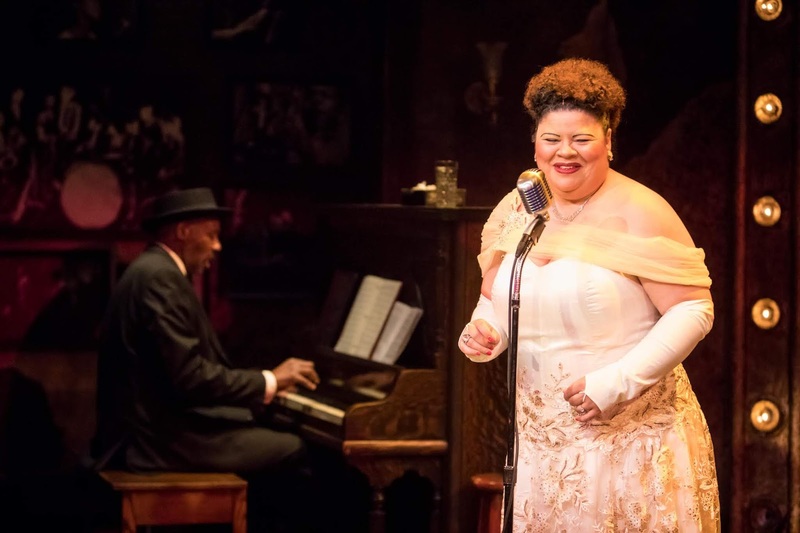 It takes place during one concert at the end of Billie Holiday's life, playing out in real time, as Billie tells stories from her past, her family, her husbands, and the racism she's dealt with in her career and as a black woman living in America in the first half of the 20th Century. Acclaimed director Marion McClinton directs Thomasina Petrus in this role that she's performed before, and was born to play. It's a perfect marriage of actor to role, with wonderful music and impeccable design that really makes you feel like you're watching the tragic end to this brilliant musician. The play begins with the three-piece band (led by Thomas A. West on piano, as Billie's accompanist/friend/manager Jimmy Powers) warming up on stage. Billie soon wanders in from the audience, and takes the stage to sing a few songs and tell a few stories. We hear about her musical influences (Bessie Smith and Louis Armstrong), her beloved mother referred to as The Duchess, her stint in jail, and the racism she experienced while traveling with other musicians in the segregated South. She slowly declines throughout the show as the drugs and alcohol in her system take effect, until she can't sing anymore. It's a story that's both inspiring and tragic to witness. I can think of no #TCTheater actor/singer/performer who could play the music legend Billie Holiday (and following in the footsteps of musical theater legend Audra McDonald) than Thomasina Petrus. Her authentic voice is something to hear, powerful and uniquely her. But for this show she sings with Billie Holiday's voice. And not Billie in her prime, but Billie at the end of her life when addiction has taken ahold of her, to the point where she can barely stagger across the stage to the microphone and sing. It takes a lot of control to play someone that out of control, and Thomasina does it expertly, in a master class on vocal control and performance. She sings a few songs as herself after curtain call and the difference is remarkable. After watching her decline as Billlie, she's once again full of life and spirit, which just makes you realize what an incredible job she does transforming into Billie. Set designer Joel Sass has turned the Jungle's jewel box of a stage into a jazz club, complete with photos on the wall of various performers. But the coolest feature of the set is the backstage room that's hidden behind a sheer black curtain under an arch that looks like a miniature of the one at the Southern Theater. By adjusting the lights (beautifully designed by Michael Wangen), we can see what's happening in that room, or it disappears into blackness. Billie wears two gorgeous gowns designed by Trevor Bowen, one white with sparkly lace overlay, one black and slinky. 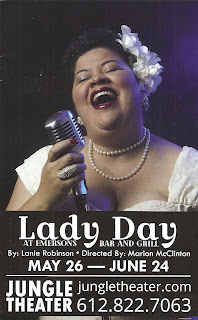 Lady Day at Emerson's Bar and Grill continues through June 24 at Jungle Theater in Uptown. It's a beautiful tribute to the woman, the legend, and the history that is Billie Holiday.